THE CHILD AT THE POINT OF GREATEST PRESSURE. 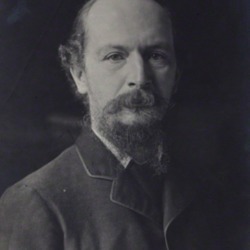 When I gave my title to Mr. Kingsley two months ago -- "The Child at the Point of Greatest Pressure" -- I had in mind something of the new life which is coming into America from the study and the care now being given to the child who lives in the most crowded and the most untoward part of the city. 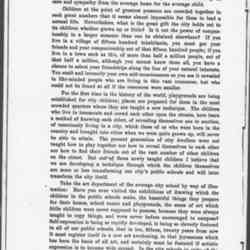 Mr. Kingsley has said that we judge anew the whole subject of the tenement house when we look at it from the point of view of the little child. 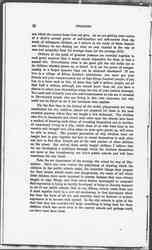 I need not therefore remind you that Paris cut new boulevards and changes the entire plan of that wonderful city if it is shown to the House of Deputies that the infant death rate has become abnormally high in a given district; that the German Parliament announces a program which may take ten years to carry out, when they are convinced that the death rate among German children stands higher than it should in the list of the civilized world; that New York appointed a drastic tenement house commission because little children were dying in too great numbers. All along the line we see that the test of civic efficiency is largely registered in the number of city children who may be induced to survive. Very recently some of us have been listening to a play written by that accurate social philosopher, Galsworthy, wherein he makes it clear that while society has made up its mind that it cannot see any body die, it is a little bewildered as to the disposition of the survivors; when we pick up the exhausted tramp on the roadside and restore him to health in an institution, we secretly wonder what we will do with him when he gets onto his legs again; when we send food and fuel to the old man who is slowly being put out of life through lack of the nourishment necessary to keep his faculties normal to the end, we cannot keep ourselves from speculating as to what use he may be after he is fed and warmed. Certainly we have reached the point that we will not allow anyone to die if he can be saved, and least of all will we allow the little child to perish who has a future before him, but are we clear as to the end in view? Having obtained that, what shall we do next? Because it is after all a negative thing to make over a quarter of a city, to change the plans of an empire in order merely to keep children alive. It is well so far as it goes, but it is not after all sufficient, and we look about to see the next step, the one beyond the mere negative salvation of human life. If we could look at these children who are under the greatest pressure because they live in the worst houses, because they have the least nutritious food, because their parents are so harried and overworked by the long hours and the new conditions they find in America, that they can give them no sympathetic care and understanding, we will discover the beginnings of a new life, something much more positive, much more [page 2] beautiful, much more all-embracing than anything we have yet dealt with, because our minds are fixed only upon preservation. 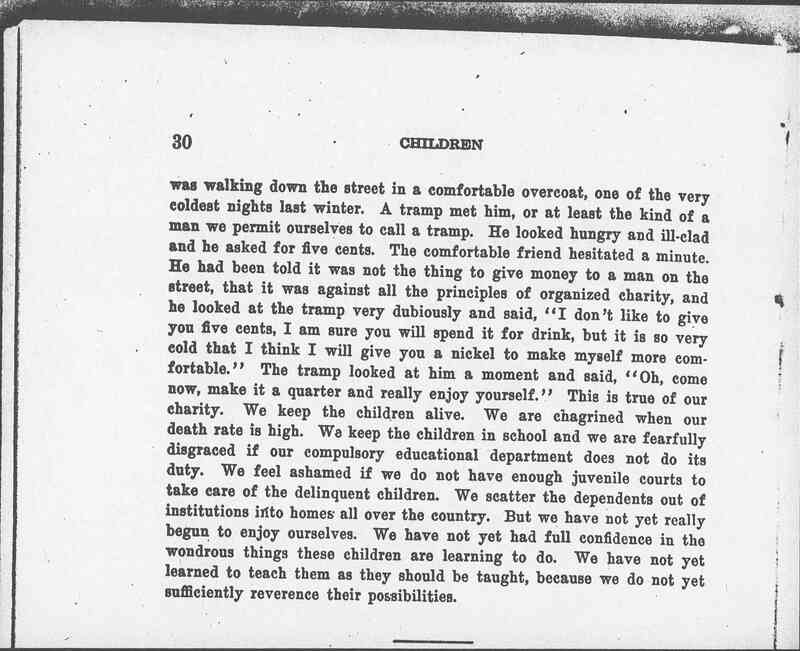 Let us take first the delinquent children, that forlorn little procession of a hundred thousand children to which Mr. Kingsley referred, who are being brought into the juvenile courts of America. The first effort we made was to keep them away from criminals, and we thought we were doing a fine thing, when children were no longer put into police stations because they had broken, sometimes in all innocence, a city ordinance. But now we are going further than that and are making a careful study of these delinquent children. 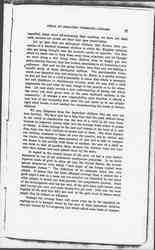 The psychopathic clinic, which was discussed only last evening by Dr. Healy, is a careful attempt to find out how far a child's mentality is below that which is necessary for self direction; to discriminate between what we may hold a child responsible for and what we may charge to his new parents or to his education. All such study reveals a new understanding of human life which has never yet been given even to the more sheltered children in the community. It charges a new responsibility upon families, it affords a new test of our sympathy with child life and opens up in our middle-aged adult brains, a new method for comprehending the needs of forlorn children. 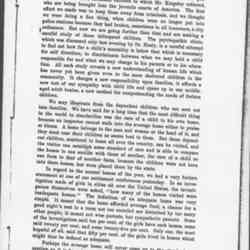 We may illustrate from the dependent children who are sent out into families We have said for a long time that the most difficult thing in the world to standardize was the care of a child in his own home, because an inspector cannot walk into the average home either to praise or blame. A home belongs to the man and woman at the head of it, and they must rear their children as seems best to them. 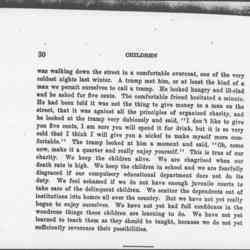 But these dependent children, scattered in [homes] all over the country, can be visited, and the visitor can establish some standard of care and is able to compare the homes in one section with those of another, the care of a child on one farm to that of another farm, because the children were not born into these homes, but were placed there by the state. In regard to the normal homes of the poor, we had a very forlorn statement at one of our settlement conferences yesterday. In an investigation made of girls in cities all over the United States, the investigators themselves were asked, "how many of the homes visited were inadequate homes." The definition of an adequate home was very simple. 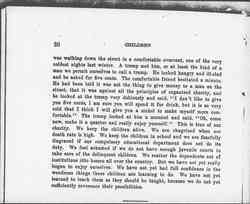 It meant that the home afforded average food, a chance for a good night's rest in a room not too crowded nor disturbed by too many other people; it meant not wise parents, but sympathetic parents. Some of the investigators said ten per cent of the girls have such homes, some said twenty per cent, and some twenty-five per cent. Only one, the most hopeful of all, said that fifty per cent of the girls lived in homes which might thus be defined as adequate. 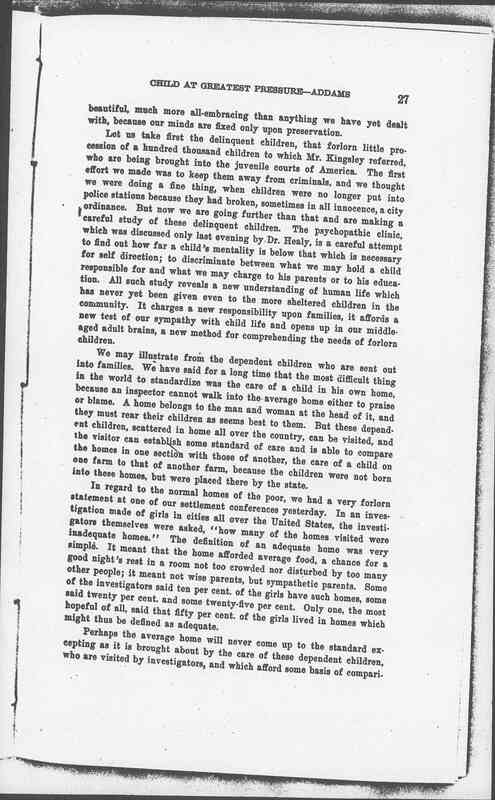 Perhaps the average home will never come up to the standard excepting as it is brought about by the care of these dependent children, who are visited by investigators, and which afford some basis of comparison [Page 3] which the normal home does not give. 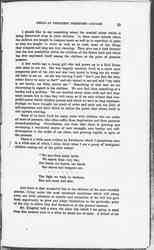 As we are getting some notion of a child's normal power of self-direction and self-control from the study of delinquent children, so I believe in the study of these dependent children we are finding out what we may demand in the way of care and sympathy from the average home for the average child. Children at the point of greatest pressure are crowded together in such great numbers that it seems almost impossible for them to lead a normal life. Nevertheless, what is the great gift the city holds out to its children whether grown up or little? Is it not the power of companionship in a larger measure than can be obtained elsewhere? If you live in a village of fifteen hundred inhabitants, you must get your friends and your companionship out of that fifteen hundred people; if you live in a town such as this, of more than half a million people, out of that half a million, although you cannot know them all, you have a chance to select your friendships along the line of your natural interests. You exalt and intensify your own self-consciousness as you see it revealed in like-minded people who are living in this vast concourse, but who could not be found at all if the concourse were smaller. For the first time in the history of the world, playgrounds are being established for city children; places are prepared for them in the most crowded quarters where they are taught a new technique. 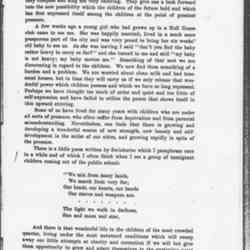 The children who live in tenements and crowd each other upon the streets, here learn a method of knowing each other, of revealing themselves one to another, of consciously living in a city, which those of us who were born in the country and brought into cities when were quite grown up, will never be able to attain. The present generation of city dwellers were not taught how to play together nor how to reveal themselves to each other nor how to find their friends out of the vast number of other children on the street. 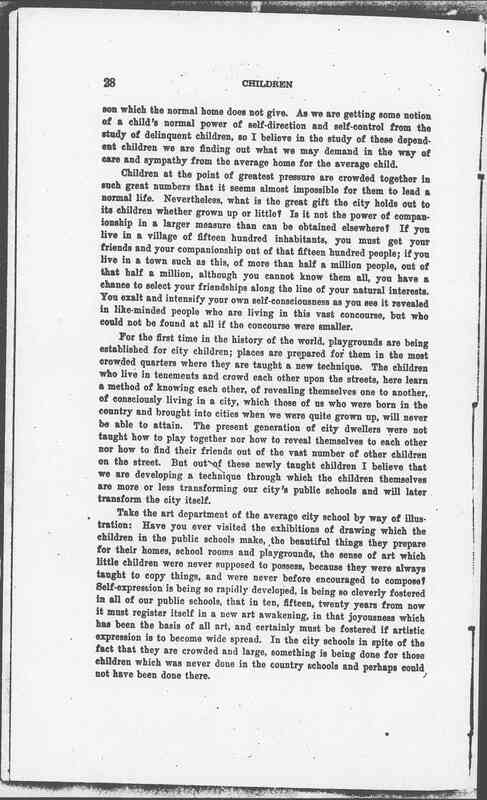 But out of these newly taught children I believe that we are developing a technique through which the children themselves are more or less transforming our city's public schools and will later transform the city itself. Take the art department of the average city school by way of illustration: Have you ever visited the exhibitions of drawing which the children in the public schools make, the beautiful things they prepare for their homes, school rooms and playgrounds, the sense of art which little children were never supposed to possess, because they were always taught to copy things, and were never before encouraged to compose? Self-expression is being so rapidly developed, is being so cleverly fostered in all of our public schools, that in ten, fifteen, twenty years from now it must register itself in a new art awakening, in that joyousness which has been the basis of all art, and certainly must be fostered if artistic expression is to become wide spread. In the city schools in spite of the fact that they are crowded and large, something is being done for those children which was never done in the country schools and perhaps could not have been done there. [Page 4] I should like to say something about the musical talent which is being discovered even in little children. In those music schools where the children are taught to compose music as well as reproduce it, quite as they are taught to write as well as to read, some of the things they compose and sing are very cheering. They give one a look forward into the new possibility which the children of the future hold and which has first expressed itself among the children at the point of greatest pressure. A few weeks ago a young girl who had grown up in a Hull House club came to see me. She was happily married; lived in a much more prosperous part of the city and was very proud to bring her six weeks' old baby to see us. As she was leaving I said "don't you find the baby rather heavy to carry so far?" and she turned to me and said "my baby is not heavy; my baby carries me." Something of that sort we are discovering in regard to the children. We now find them something of a burden and a problem. 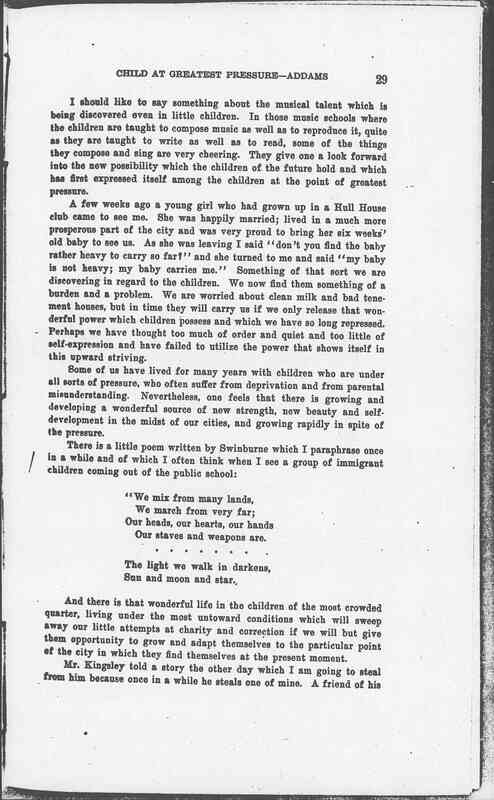 We are worried about clean milk and bad tenement houses, but in time they will carry us if we only release that wonderful power which children possess and which we have so long repressed. Perhaps we have thought too much of order and quiet and too little of self-expression and have failed to utilize the power that shows itself in this upward striving. Some of us have lived for many years with children who are under all sorts of pressure, who often suffer from deprivation and from parental misunderstanding. Nevertheless, one feels that there is growing and developing a wonderful source of new strength, now beauty and self-development in the midst of our cities, and growing rapidly in spite of the pressure. Our staves and weapons are. Sun and moon and star. And there is that wonderful life in the children of the most crowded quarter, living under the most untoward conditions which will sweep away our little attempts at charity and correction if we will but give them opportunity to grow and adapt themselves to the particular point of the city in which they find themselves at the present moment. Mr. Kingsley told a story the other day which I am going to steal from him because once in a while he steals one of mine. 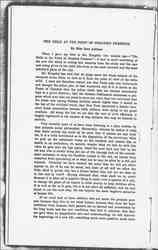 A friend of his [Page 5] was walking down the street in a comfortable overcoat, one of the very coldest nights last winter. A tramp met him, or at least the kind of a man we permit ourselves to call a tramp. He looked hungry and ill-clad and he asked for five cents. The comfortable friend hesitated a minute. He had been told it was not the thing to give money to a man on the street, that it was against all the principles of organized charity, and he looked at the tramp very dubiously and said, "I don't like to give you five cents, I am sure you will spend it for drink, but it is so very cold that I think I will give you a nickel to make myself more comfortable." The tramp looked at him a moment and said, "Oh, come how, make it a quarter and really enjoy yourself." This is true of our charity. We keep the children alive. We are chagrined when our death rate is high. We keep the children in school and we are fearfully disgraced if our compulsory educational department does not do its duty. We feel ashamed if we do not have enough juvenile courts to take care of the delinquent children. We scatter the dependents out of institutions into homes all over the country. But we have no yet really begun to enjoy ourselves. We have not yet had full confidence in the wondrous things these children are learning to do. We have not yet learned to teach them as they should be taught, because we do not yet sufficiently reverence their possibilities. 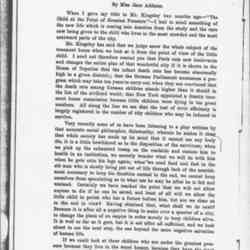 Jane Addams, "The Child at the Point of Greatest Pressure," National Conference of Charities and Corrections, Proceedings (1912): 26-30. 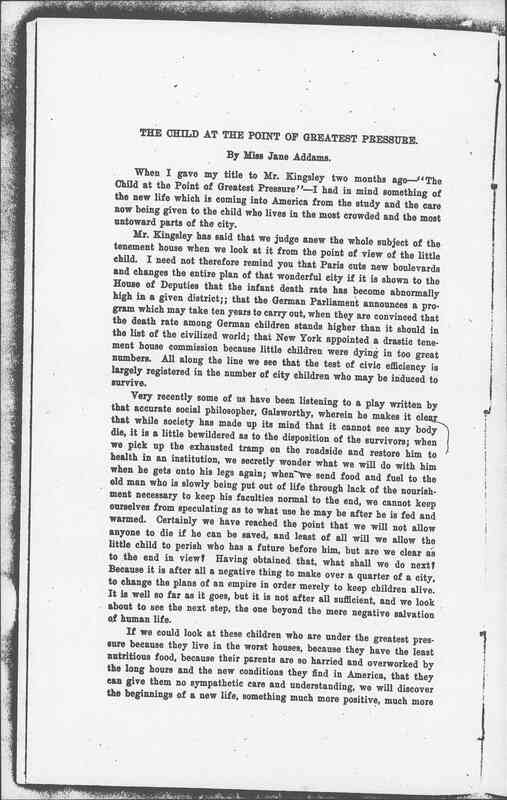 Addams, Jane, “The Child at the Point of Greatest Pressure, June 16, 1912,” Jane Addams Digital Edition, accessed April 25, 2019, https://digital.janeaddams.ramapo.edu/items/show/7934.